With the launch today of the Freeview HD service, the UK can claim to be at the forefront of digital television - though most punters won't be able to receive the service until spring 2010. Today’s launch saw services switched on at the Crystal Palace and Winter Hill transmitters, between them providing coverage for around 22-23 per cent of the UK’s population. It’s described by engineers and telly executives as a "technical launch", however, with the consumer launch not taking place until late Q1/early Q2 next year. As of today, while we may have the first operational TV service in the world using the new DVB-T2 standard, there aren’t any receivers available to buy. Ilse Howling, Managing Director of Freeview, told Register Hardware that she expects that equipment will start to appear in stores in January and February of next year, with widespread availability around March. By then, it’s anticipated that around 40 per cent of the population will be covered, rising to 50 per cent in time for next year’s World Cup. For detailed roll out dates, see the last page of this report. Winter Hill is the first station to provide a high-power Freeview HD signal, any anyone who received Freeview in the Liverpool and Manchester area should pick up the new HD multiplex from it. The Crystal Palace transmitter, in common with the other early ones, will be running on lower power. Nevertheless, from the map that was briefly displayed, it looks like coverage will extend to Enfield in the North of London, and in some areas a little further out – sporadic coverage seemed to be going as far as Hertford. There’s now a little more information about the technical details of the service too. Four manufacturers had prototype receivers on show at the launch, with set-top boxes from Pace and Vestel, together with integrated Freeview HD TV sets from both Panasonic and Sony. 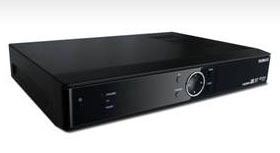 In order to qualify for the Freeview HD logo, receivers will need to be IPTV-capable.